Michael Rosenberg's exciting action thriller, "The Fabulous Fanshaws Book Two: The Return to Lendorth," takes place in a parallel universe. 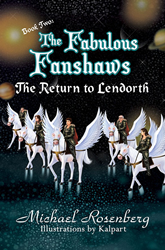 The exciting action thriller, "The Fabulous Fanshaws Book Two: The Return to Lendorth," takes place in a parallel universe named Lendorth. Its people enjoy advanced technology, but live in a medieval environment, similar to the knights of Camelot. In this second book of the series, the Fanshaw Family is transported into Lendorth, where the father, Walter, is once again a knight. His children Rupert and Geraldine have plenty of adventures, but long for their old school classmates. When they finally return home, they wish they could tell everyone what happened to them. But would anyone believe it? The Fanshaws decide the only way to tell their fantastic story is to create a TV series. Talk about reality TV! The Fanshaws are about to give the Kardashians a run for their money. About the Author: Michael Rosenberg began work as a messenger boy in London for a merchant bank. Fifteen years later, he was appointed to the bank’s board of directors. He later co-founded a healthcare services business that became a global business. He was involved in media and in TV for many years, and was the executive producer on several films. The author was awarded the OBE for services to exports, mainly relating to Asia, where he led a number of trade missions. In recent years, he has been a consultant and director for companies listed on the London Stock Exchange. This is his second book in this series aimed at older children, and his eighth book in total, six of which are for young children. “This science fiction series for young readers opens up a whole new world of possibilities. Join the Fanshaws for another ‘Fabulous’ ride,” said Robert Fletcher, CEO of Strategic Book Publishing and Rights Agency. http://www.sbpra.com/MichaelRosenberg or at Amazon.com or Barnesandnoble.com. WHOLESALERS: This book is distributed by Ingram Books and other wholesale distributors. Contact your representative with the ISBN for purchase. Wholesale purchase for retailers, universities, libraries, and other organizations is also available through the publisher; please email bookorder(at)sbpra.net.